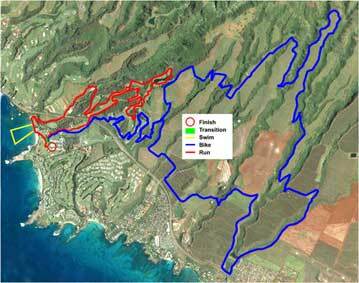 The Kapalua Bike Trails and Run Courses for the XTerra World Championships. Are you an XTERRA off road triathlon fan? Are you planning a bicycle trip to Maui for the 2012 XTERRA World Championship? After last year's move from Makena to the Kapalua Resort in West Maui, the 17th XTERRA World Championship returns to Kapalua on Sunday, Oct 28, 2012. You'll barely be finished watching the Olympic mountain bike races in England before the 2012 XTERRA weekend of off road triathlon and bicycling on Maui! The week leading up to the XTERRA World Championship on Sunday is always exciting for Maui visitors attending XTERRA and local Maui cycling enthusiasts alike! Check out the XTerra trail maps or the XTerra bike and run profiles. Then, continue reading (after the vids) for info about a couple other upcoming Maui cycling events. Still not convinced you should book a Maui cycling vacation for the 2012 XTerra at Kapalua? Check out the 2011 XTerra World Championship Course Preview Videos to convince yourself. Use the bike blog comments to let us know if you think the course for the moutain bike trails or the XTERRA run and bike course profiles at Kapalua will be difficult? Prior to the XTerra World Championships on Sunday October 28, Kapalua is hosting a weekend of XTerra events including The Kapalua 5/10 Trail Run and Keiki K on Saturday. Recently signed, TS Restaurants renewed their title sponsorship for the 2012 XTERRA events on Maui. Don't miss the Keiki K for kids 10 and under. Sign up and run in The Hula Grill XTerra 5K Trail Run or The Duke's Beach House XTerra 10K Trail Run.Read the XTERRA Planet news release about TS Restaurants 2012 XTERRA title sponsorship. After the XTERRA World Championships on Maui, may as well stay another weekend and make it two Maui biking weekends in a row with the TriLanai Off Road Sprint Triathlon. The event is held across the channel from Lahaina on Maui's neighbor island of Lanai the weekend following the XTerra World Championships on Maui. Many of the XTerra participants, fans, sponsors and volunteers head to Lanai for a more relaxed TriLanai triathlon. The TriLanai triathlon features a .5 mile swim, a 10 mile mountain bike course and a 3 mile run. Go to the TriLanai Lanai Triathlon website for details and entry forms. Get a bike rental at West Maui Cycles in Lahaina and take the bike on the Lanai Ferry for only $10 each way. Even if you don't compete, mountain biking the Munroe Trail is a blast! Though no bike component for this event, a tuneup running event on Lanai takes place this coming weekend with the TriLanai City Walk Run for half marathoners and shorter distance runners compete in 21K,/ 10K and 5K events. All events start and end at Dole Park in Lanai City. Ready for the ultimate Haleakala bike ride challenge? The annual Cycle to the Sun Maui cycling event is coming up in a few weeks at the end of August. Cyclists from around the globe will descend on Maui to compete in the Cycle to the Sun bike race. Who will be first to the top of the longest steepest paved road climb on the planet? The 2012 Cycle to the Sun takes place on Saturday, Aug 25, 2012 and begins at 6:30 am. If you'll be biking on Maui during any of these events, be sure to reserve a Maui rental bicycle. Our West Maui Cycles bike shop in Lahaina is stocked with Maui bike jerseys, bike water bottles and bike logo gear to remember your Maui cycling vacations. As you would expect from a full service bicycle shop, in addition to bicycle parts, bike gear and performing bike repairs, we rent high performance road bikes and mountain bikes. For high performance Maui road bike rentals, we offer the Specialized Roubiax SRAM Rival Carbon Fiber. If you want to ride a hardtail during the 2012 XTerra World Championships at Kapalua, a Specialized SumpJumper HT 29'er bike rental is the Maui bike rental for you! We've already booked a few bike rental reservations for XTERRA 2012 - Reserve your bike rental on Maui NOW!